But knowing is a burden. It wasn't her smile that won me over. It wasn't her personality or her non-existent charm. But all the same I could care less. But I did love her voice, rough and satin smooth all the same. I looked upon an imperfect vision, a broken girl in a worn out mental shell, wearing thin and begging for something to assuage her bruised heart. Every part of her shattered mind. As if a single name was enough for her. Slowly shimmering in a vacuum, with just enough gravity to pull them downwards with the rest of her soul. Fell like a slowed explosion, from her, the epicenter, outward from a source of hidden beauty. So I watched silent, as the silent bomb took another drag and the smoke blew upwards as the blast raged on. And she lit another cigarette. Not even Pollock could compare. If either of us knew what a future could come from such a crooked wreck. 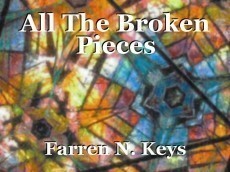 In all those broken pieces. by handing me one of her cigarettes. © Copyright 2019 Farren N. Keys. All rights reserved. What a fantastic poem! And those descriptions -- brilliant! This page was created in 0.4210 seconds.